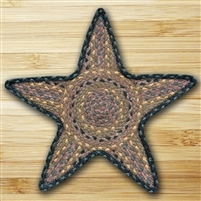 These braided star trivets measure 19" x 19" and are 100% Natural Jute Fiber. You can use them under hot dishes or pottery and they make great accent pieces too. Spot clean with mild soap and water.